Oh, Xavi. What a player he is, even now, aged 34 and with 250,000 miles on that refined dashboard clock. In fact there was something agreeably warm and nostalgic about seeing that familiar keep-ball trinity, Xavi, Andrés Iniesta and Lionel Messi once again in action against an English team. Although, with this in mind, it is probably worth noting that this could turn out to be the last time we ever get to see the three of them together very politely and insistently torturing some unfortunate Englishman – on this occasion Joleon Lescott, who despite an excellent showing by City overall seemed to be constantly flailing around in the vague vicinity of the ball at the Camp Nou, going about his business with all the assured defensive control of a drunken farmer who has just fallen off his tractor and is now engaged in thrashing about in the dark looking for his hat, glasses askew, ankles tangled in chicken wire. Of these three great Barcelona players it is – perhaps unexpectedly – Xavi who stands out above all, an astonishingly relentless, unexpectedly definitive presence who, all things considered, has been the best player in the world for the last five years, and whose broader influence probably matches that of any player in any era. No footballer has ever played such a decisive role in victory at three major international tournaments, or defined so clearly the dominant club team of the age. Xavi has won 25 major trophies, made more than 180 assists for more than 50 team-mates at Barcelona, and has over the last six years passed the ball more than anybody else, run more than anybody else, and basically played more football than any other human being anywhere. 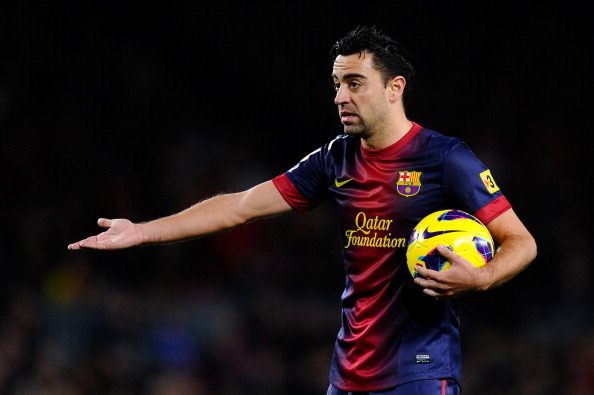 And this is really the key to the triumph of Xavi-ism. Never mind the goalscorers, the cossetted glory-boys parcelling out the Ballon d’Orbetween them season after season. Messi may be brilliant, but he is brilliant in a way footballers have pretty much always been brilliant. Xavi on the other hand, is something new, a player of preternaturally precise talents whose style – brutal, exhausting, aggressively unrelenting possession-football – has spread by trickle-down to lend a Xavi-coloured hue to pretty much every high-end midfield in every successful team anywhere. For the first time the ability to pass and move has been elevated to the primary skill, that unyielding mid-90s pass‑completion percentage enshrined as Xavi’s own statistical badge of greatness, like Don Bradman’s 99.4, or Pelé’s 1,000 goals.Albeit what sets him apart is the fact that these so often tend to be passes that decide the momentum of a match, either by dramatic incision or attritional disintegration. Plus, his influence remains all-pervasive. Even the 7-0 aggregate defeat by Bayern Munich in last year’s Champions League was in its own way a triumph of Xavi-ism, the most flattering of personal annihilations by tooled-up, brilliantly mimetic opponents, that even in crushing victory still seemed to say, ‘Yes, it turns out you were right all along.’ For now, and for all the talk of a move to the US at the end of the season, football’s own incognito Napoleon is still among us, to be enjoyed while we still have the chance, an enduring three-quarter-sized giant of the age.